I have two kids and during the Summer I'm always looking for ways to entertain them. My oldest daughter is 9 years old and loves making things and doing crafts. She goes through "phases" when it comes to her crafts. For a while, she was really into making those band-a-loom rubber band bracelets. Now, she's into "melty beads". I'm sure most of you know what melty beads are, even though you might not think so. Remember those little cylindrical beads that you placed on pattern and then ironed them so they stuck together? Yeah, that's what a melty bead is. One night, my daughter presented me with a bowl made from melty beads. 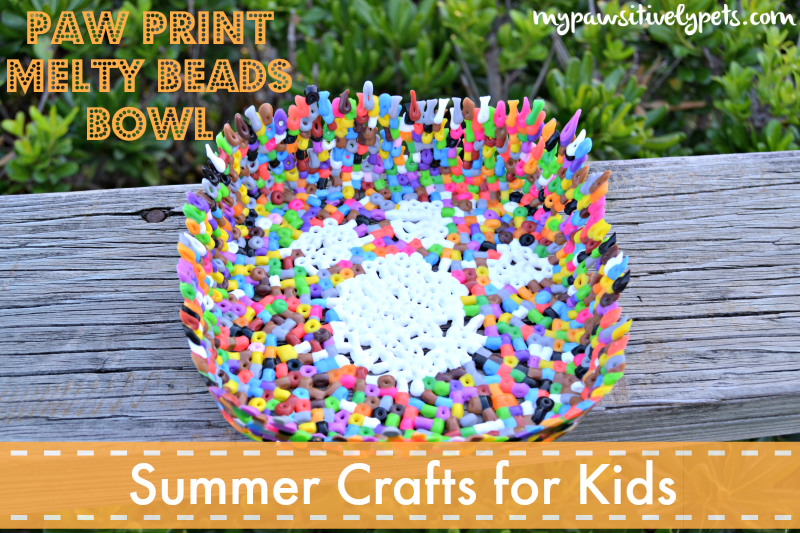 I was kind of amazed that she was able to make a bowl out of little plastic beads, so thought I'd share a tutorial here on the blog. 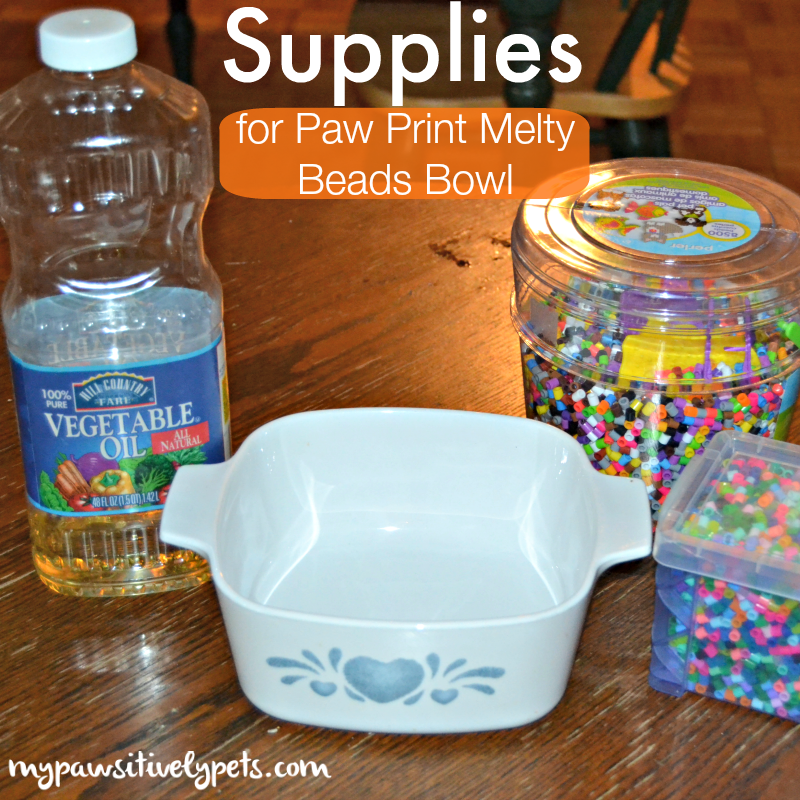 Of course, we have made our melty beads bowl pet friendly by adding a paw print in the middle. 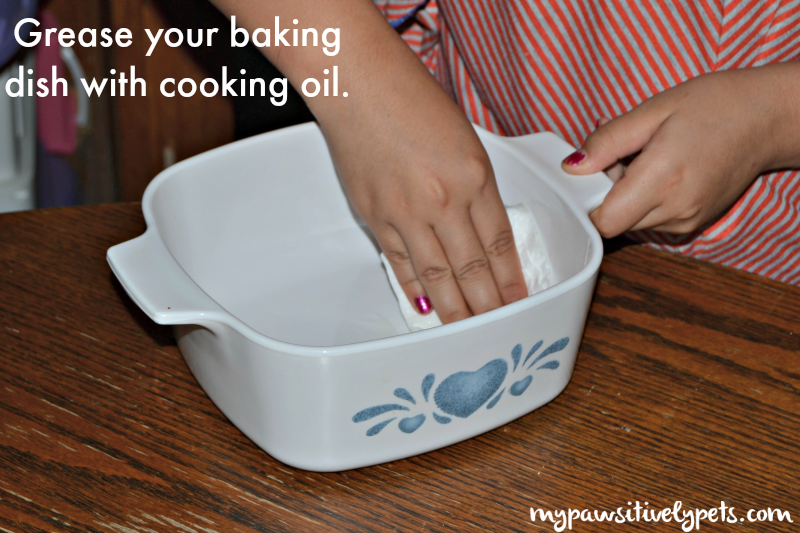 To start off with, you'll need to grease your baking dish with vegetable oil. We didn't use much, maybe 1 teaspoon to 1 tablespoon. You can rub the oil on the sides of the dish with a paper towel. Any type of cooking oil will work. We used a glass casserole dish. I know what you're thinking - those melty beads are going to stick to my dish! I thought so too, but they do not stick at all if you apply the oil well. Next you'll want to place your paw print cookie cutter in the center of the glass baking dish. I highly recommend a cookie cutter, BUT if you don't have one there is another way. We did ours the hard way, because I don't have a cookie cutter. We cut a strip of paper and rolled it up long ways. Then, we taped the ends together and created a circle. Just place your circular piece of paper in the center of the dish. Next, fill your cookie cutter or piece of paper with one color of melty beads. We chose to use white so that it would pop more. 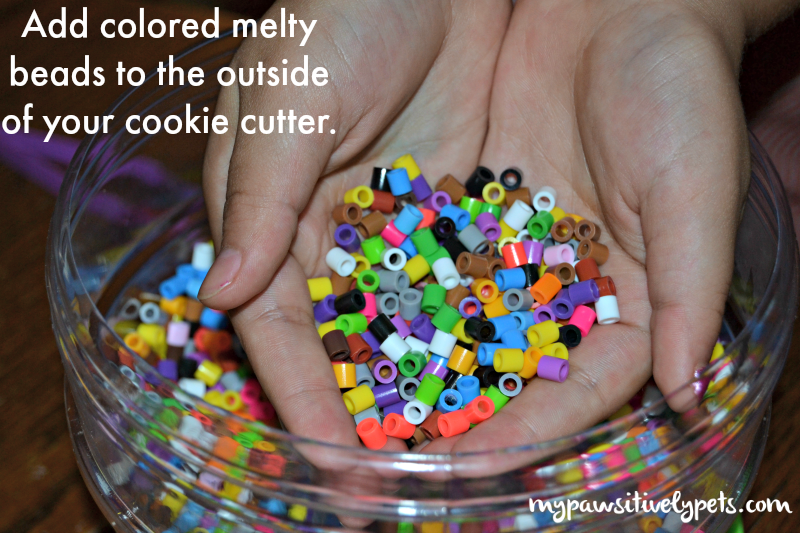 Keep your cookie cutter in place and on the outside of it, add more melty beads of a different color. Since my daughter's melty beads were all mixed together, I opted for a "rainbow" bowl because I didn't want to sit around digging through the melty beads for just one color. Now, you'll need to push down gently on the melty beads with your hands. This causes them to slide up the walls of the baking dish, to which they will stick to. Add more melty beads to the dish as needed and continue to press down on them with your hand until they are as far up the sides of the dish as you desire. Note that the beads should all be in a single layer. 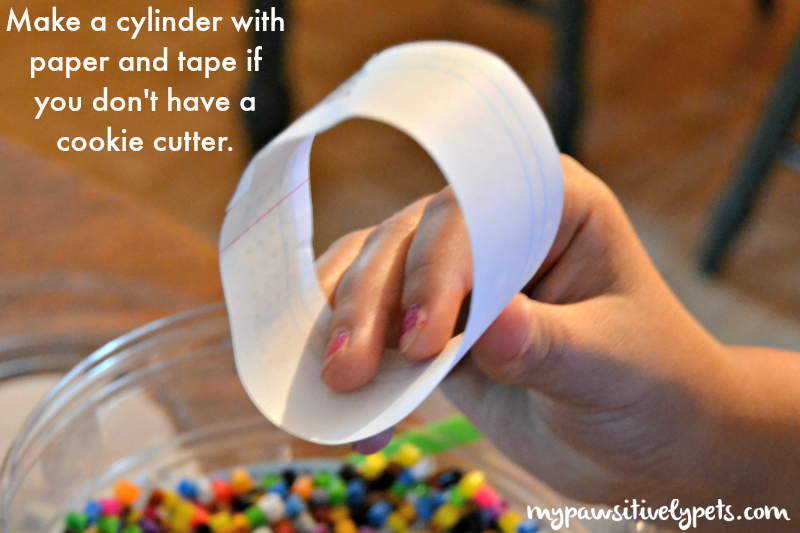 If you used a piece of paper instead of a cookie cutter, you'll need to make your own toes for the paw print. To do this, we removed a few of the rainbow colored melty beads and replaced them with white ones in 3 circles above our big white circle. This was all done by hand and we did not use a pattern for it. Which is why a cookie cutter would be ideal. 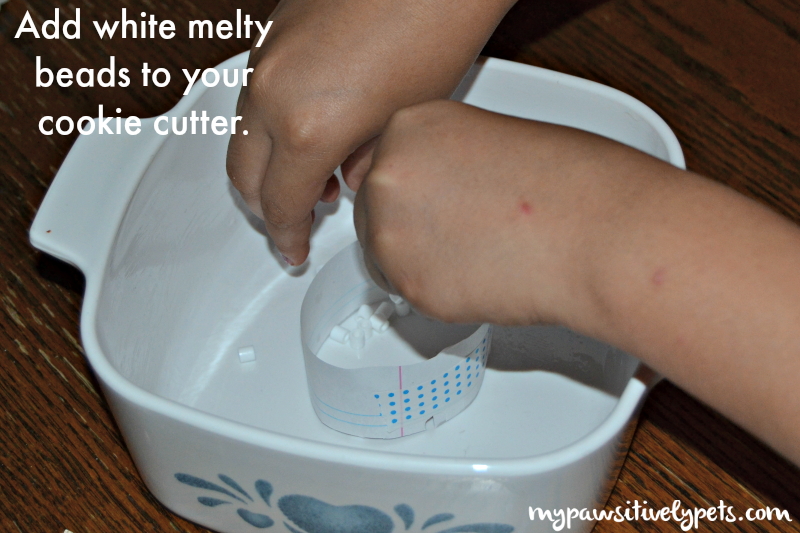 Now, your paw print melty beads bowl should be ready to bake! In a 400 degree oven, bake your bowl for 20 minutes. We put ours in the toaster oven. When it's done, carefully remove the dish and set it aside to cool. My daughter likes putting hers in the freezer so it's ready faster. Once it's cooled down, carefully pop your melty beads bowl out of the baking dish. A butter knife might come in handy for this part. Afterwards, you should have an interesting little melty beads bowl! Having a dog party? 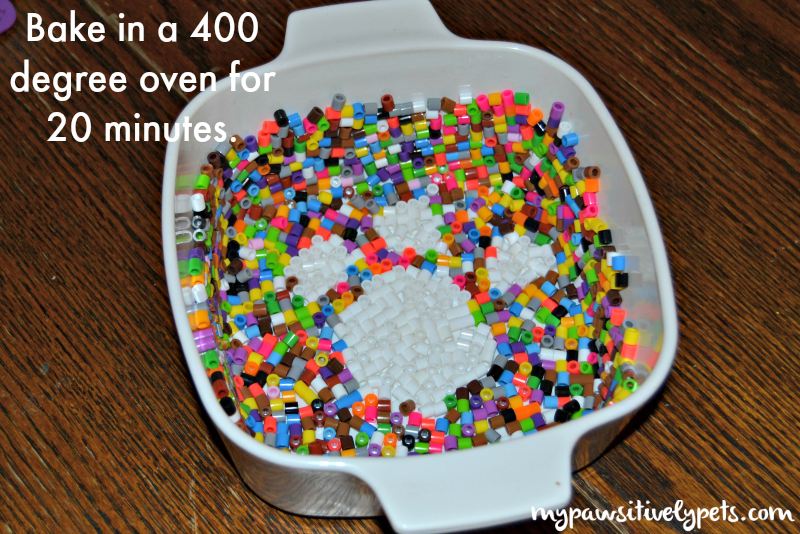 Add treats to your paw print melty beads bowl and turn it into a serving tray. Or let your kids do what they like with it. This craft is very versatile and you can create different shapes or patterns with it. If you make one of our paw print melty beads bowls, please be sure to share the final masterpiece with us on social media! Happy crafting! I was a fan of melty beads too, it's wonderful what creations you can make, just with this small pearls! This was fabulous!! You know I will be trying this at some point, as soon as I get more of those melty beads (ours are used up). My daughter will love this. Thanks Ann!! Aw definitely let me know how it turns out! That is pretty amazing and it looks so cool! Aww!!!! That is so cool!!! My kids would love to make this! I could see kids loving this! Very cool! 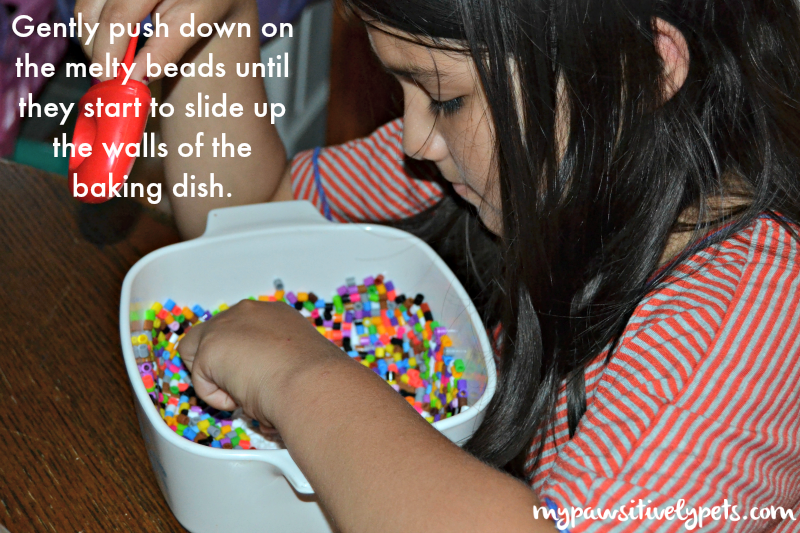 I've never heard of melty beads, but they look like fun! thiz iz prette kewl shiner.....how much "help" did ewe offer N wearz yur cookies....hay, if de oven iz ON...mite az well bake sum cookies huh ! !